Matias Lucuix was part of the elite – the creme de la creme. His career could have reached its zenith at the FIFA Futsal World Cup in Thailand back in 2012, but a serious injury ruled him out and ultimately brought a premature end to his playing days three years later. Now he is head coach, in charge of both Argentina’s senior and U-18 teams, with the latter looking forward to an historic event in futsal terms – the Youth Olympic Futsal Tournament Buenos Aires 2018, which will see the sport playing under the five-ring flag for the first time. 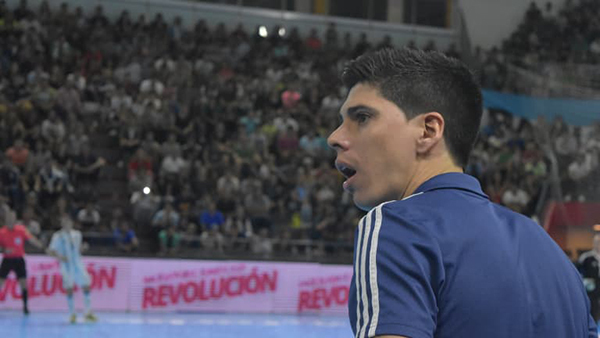 "It’s a dream for anyone who used to play and who’s now a coach," said Lucuix to FIFA.com a few days before Argentina’s opening match against Egypt on 7 October – the day when futsal will finally becomes an Olympic discipline. "It’s a sport that deserves the chance that it’s being given. It’s the first step on the road to it also happening at senior level. The sport is really taking off – you can see that in the number of players and championships, at every World Cup, every European Cup, every Copa America. We need to analyse this aspect of things and really weigh up what is happening because it’s an important part of the development of futsal." The enthusiasm in 32-year-old Lucuix’s voice shows exactly how excited he is to see his youngsters out on the big stage. "I’m delighted and really looking forward to it getting started," he says. "I can’t wait for the competition to get under way. The lads feel the same too." The high levels of excitement are hardly a surprise – the country is home to the reigning world champions, meaning that Argentina’s youngsters are going to have to cope with the pressure of being in the running for a medal and deal with conditions that they have yet to experience. "They are 10 young lads in a privileged spot – they are playing for their country, in their country, with their friends out in the stands cheering them on at what is a world first for Olympic futsal... It’s going to be tough," Lucuix adds. "You can see it in their faces when they train and when they take part in competitions. You can tell which players will be more affected by the pressure, which ones less so. We’re trying to talk to them, manage them, understand them and help them to enjoy themselves. We don’t want them to crumble under the goals that we are aiming for through our work. That’s all we can ask for." Lucuix is convinced that that work, which began with this generation of players two years ago, back when he was assistant coach to Diego Giustozzi (who led Argentina to the world title in Colombia in 2016) will transform this challenge into a springboard. "We’ve played in a lot of tournaments, played a lot of matches, travelled a lot. The guys have played against kids their own age or older, in Europe, South America. We’ve tried to ensure that they get a little bit of experience, so that they don’t suddenly find themselves pulling on an Argentina shirt for the first time. There are lads who’ve already played 15 or 20 matches for their country – some full internationals don’t have that many caps to their names. We’re expecting them to shrug off the pressure and play for themselves as opposed to against themselves." Meanwhile, the coach already knows whom he expects the toughest opponents to be. "Brazil, Russia and Iran are very strong teams, who will be coming here with the expectation of a gold medal," he says. And even though his main hope from a global point of view is that "we get to see some exciting matches", he is already looking forward to 18 October when the gold medal match will be played. "Let’s hope we get through to the final that the boys are all so looking forward to," he says, "for our sake and for sport in general in Argentina".